Day One of P1 started really early. Sky was still dark. As expected, Baby G had problems waking up. 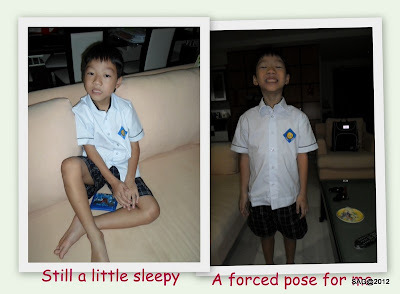 Clearly he was in no mood to take any pictures hence only 2 shots of him and that, I had to cajole him to pose for me. 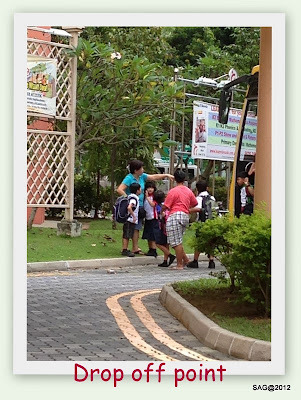 We were late, reached school at 725am. I think he was the 2nd last pupil to go in. 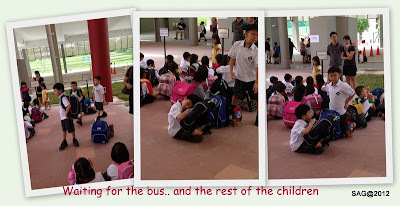 There wasn't much time to give him any instructions so I just dropped him off at his class and waited outside. 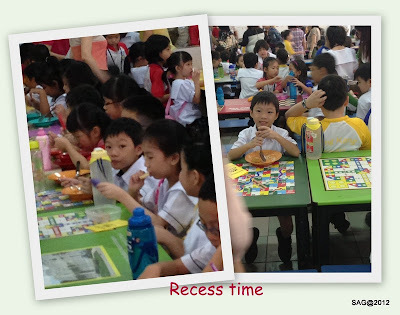 As the school was still undergoing some renovations, the P1 students were moved to a separate area of the school premise. This made the place very exclusive and hence, not as chaotic and noisy as I was expecting. 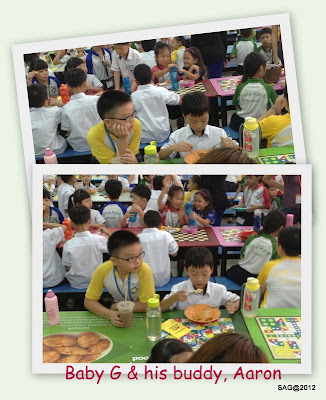 Even the parents were calm and followed instructions well. After singing the national anthem & saying our pledge, we went up for a parent's talk arranged for us to keep us occupied before recess time. Then he and his buddy went off to buy a cup of milo.... I was getting a little worried cause he only had $2.50 in his wallet. I was sure it would be over-budget. 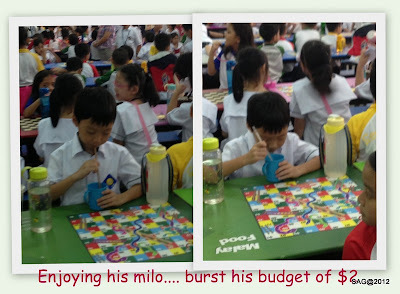 Luckily, he had some additional coins that his shu-shu gave him so he got his milo. Will need to have a talk to him about drinking his own water rather than buying additional drinks... else at this rate, the recommended $2 is not going to be enough for him. 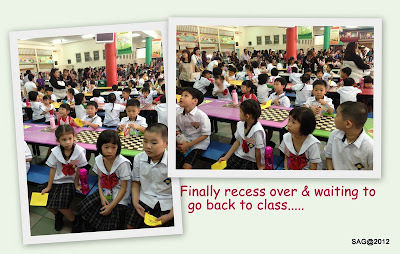 After recess, the parents were told to come back to school again during dismissal time. 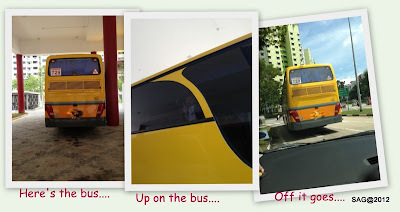 We went off for our late breakfast and took a short rest at home before returning. 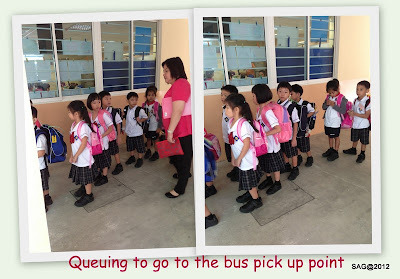 We came back just in time to spot him queuing up to walk to the waiting area for the bus. Throughout the entire time, we kept our distance from him and he seemed quite comfortable with it. He didn't rush up to us when he saw us at various points of the day. We tried to communicate with a little hand signals and a little lip reading as I mouth the words to him and he mouthed back to me. 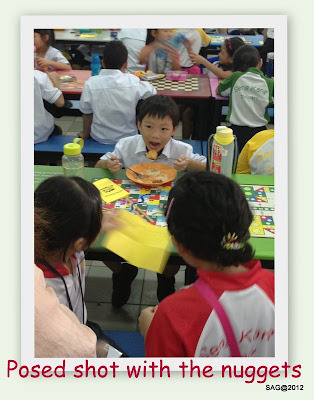 And a sense of relief that he is back at his after school care. A day of many new things for Baby G, lots to take in and learn. He has grown up and crossed another milestone in his journey through life. Mummy & Daddy are proud of you. Wow.. Such an eventful day! 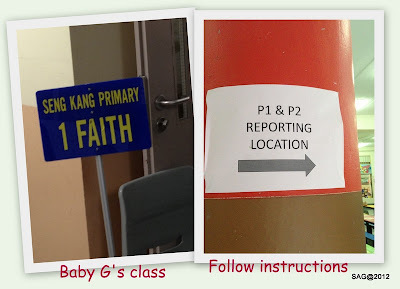 Congratulations Baby G, another milestone accomplished!